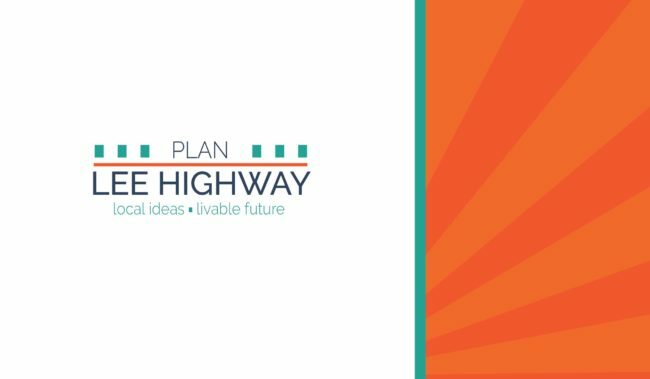 Building on visioning work by the Lee Highway community in 2016, the County is leading a community planning process for Lee Highway that takes a closer look at the long-term goals for this important corridor and its surrounding areas. The County has designed a multi-layered engagement approach that will include broad participation and many opportunities for input from residents, businesses, community groups and stakeholders. A Community Forum (over 50 members) and a subset Working Group (10 members) have been appointed to represent a broad set of interests and provide feedback throughout the study. Learn more about study participants, the civic engagement framework, the study area and a projected timeline. All project documents related to planning process will be posted to this site. The purpose of the planning study is to develop a comprehensive vision and policy framework for the future of the Plan Lee Highway Study Area through County Board adoption of a County Plan. Given the character of Lee Highway and limited planning to date, there is a mounting desire within the community to improve the corridor and consider how future development can transform the character in a positive rather than a reactive manner. 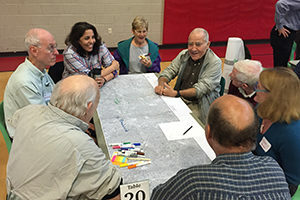 A grassroots effort led by community leaders in north Arlington paved the way for a community-wide visioning process and the Lee Highway Visioning Study (May 2016). The vision, a culmination of a seven-month study, illustrates the the community's main ideas and proposes key ingredients for the future of this important east-west corridor. This vision calls for Lee Highway to become a walkable, urban main street with a string of neighborhood activity centers between Rosslyn and East Falls Church, along with new transportation and housing options, better public spaces and more. 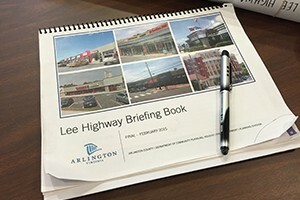 The visioning process was a unique, joint effort between Arlington County and the Lee Highway Alliance (LHA) to achieve a vision that balanced a broad range of perspectives. The LHA is a coalition of 18 civic association leaders who have actively engaged communities along Lee Highway since 2012 to develop a community-based vision, and identify actions and strategies to achieve it. 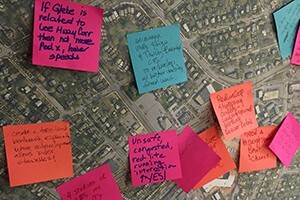 Outcomes from a four-day community visioning charrette, along with public reviews, informed the content of the final document which the LHA presented to the County Board on May 17, 2016. Learn more about the Visioning Study process (coming soon). 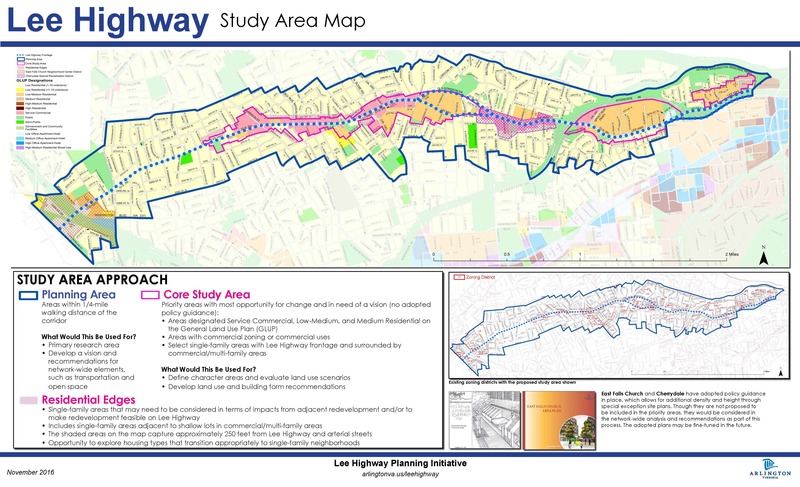 There have been two previous significant planning efforts in the Lee Highway Corridor Planning Area, the Lee Highway Cherrydale Revitalization Plan (1994) and the East Falls Church Area Plan (2011). Each of these plans establish a vision, goals, and specific recommendations for land use, streetscape, transportation, open space, and other planning elements and have been used to guide redevelopment projects. Specific districts on the General Land Use Plan for Cherrydale and East Falls Church provide high-level planning guidance for those areas. Cherrydale and East Falls Church will remain in the broader Lee Highway Planning Area, to develop a cohesive vision and recommendations for network-wide elements, such as transportation and open space. The study will identify issues that may require a future analysis (including the potential review and refinement) of these adopted plans to align with the new policies presented in the Lee Highway Plan.